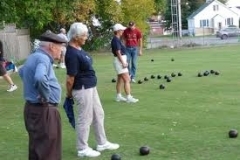 Lawn bowling has been active in Arthur for many years. It is not expensive and is lots of fun for all ages. You can get involved in tournaments in other towns – Mount Forest, Dundalk, Palmerston and others.In Arthur our regular evening games are held on Monday and Wednesday evenings at 7pm. You are always welcome to come out and try it. We can supply you with bowls to use to see if it is your thing. Located behind the Anglican Church.